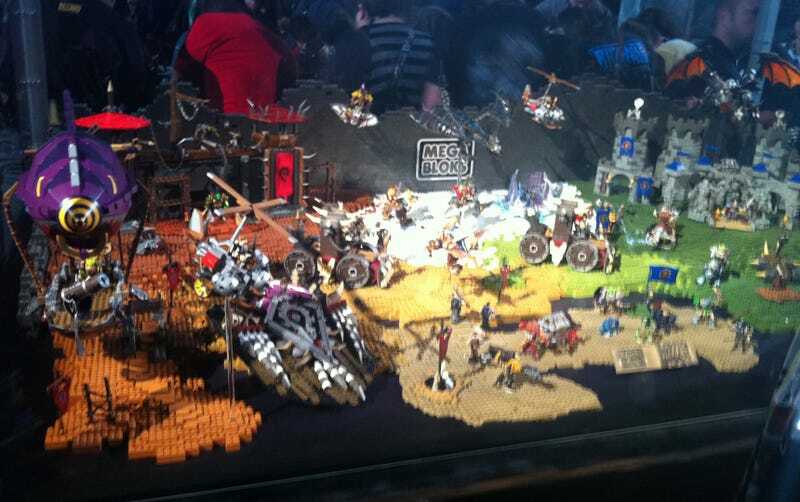 When I first heard Mega Bloks was doing toys based on the World of Warcraft brand, I imagined a couple battlefield sets, maybe a fort or two. What they're bringing to store shelves next summer turned out to be far more ambitious. What you see here represents the first wave of World of Warcraft Mega Bloks, and they've already got a massive chunk of Azeroth rendered in small blocky form. From war machines to dragons to entire sections of Orgrimmar and Stormwind, Mega Brands won't rest until every possible Horde versus Alliance scenario can be reproduced using their products, and every dollar in my bank account is drained. I mean come on, even if you hate toys entirely — say a toy killed your father, for instance — you've gotta love those Horde and Alliance shields. Flip through the gallery to see everything Mega Bloks is bringing to the World of Warcraft.